All the wrangling and grandstanding in Europe today has one purpose; to force Greece out of the Euro while convincing all other countries to stay in the Euro. The Germans and the Troika want Greece out, even though they cannot say it out loud. The Greeks want out, even though they cannot say it out loud. And they all want the Grexit for their own reasons, little of which have anything to do with the good of Europe of the Euro per se. So Wow, OXI (No) won, and by a landslide. Surprised? Then again, anyone listening to anything coming out of Greece should have expected it. With the deal off the table, a Yes vote would have been the equivalent of signing up for German Language lessons. A Yes vote was simple capitulation to Berlin and Brussels, even if dressed up as a vote for stability. 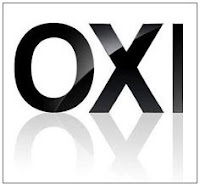 OXI was an affirmation of the independence of Greece and the Greek people. I wrote on April 15th, 2015 that the Grexit was inevitable, and it still is. Sure, there is another conference, and there will be another after that. Nothing will be achieved in these conferences; if the Greek government does not agree to capitulate to serial defaulter Berlin and Brussels, aka The European Branch of Goldman. And nothing will be agreed because it is already accepted that the loans cannot be repaid, that the debt is unsustainable. Therefore, asking Greece to demonstrate how they can pay back loans that they cannot repay is asking them to lie, again. If the Troika, Germany and the rest of Europe are willing to pretend, then maybe. But nobody is pretending any longer. And while Prime Minister Tsipras insists that he does not want to leave the Euro, those statements are for the "centre-left" of his party and the wider population, as they face insult after insult from their European brothers. In reality, Tsipras has no intention of staying in the Euro, and is actively creating the situation that enables an exit that can be "blamed" on the Troika, Germany and France. Greece’s prospects of staying in the eurozone have dwindled further after the Prime Minister Alexis Tsipras arrived at an emergency summit of his fellow eurozone leaders in Brussels without a concrete plan to resolve his country’s debt crisis. All Tsipras need to do now is wait for the news to gets out that Europe will demand that all Greek bank accounts be raided in a "Depositor Bail-in" - the numbers vary from as little as 30% of all account values greater than €8,000 up to "What have you got, hand it over". This would see what little is left in any Greek bank account confiscated. Think Cyprus without any mercy. Once that is presented as part of the in-or-out proposal from the Troika, Tsipras, with no money left in the banks, will have the support he needs to introduce a New Drachma. Because we need to be clear, there are, from the Loan Sharks perspective, only two options. I'm sure they've gamed this out already, but I see only one longer-term outcome. Write a deal that will save Greece, and watch the other countries demand the same. Punish Greece, leading to the introduction of IOUs (also known as New Drachmas) and force Greece out of the Euro. Both of these lead to the same longer-term outcome: death of the Euro, but option 2 pushes it out to someone else's watch. With option 1, the demanded bailouts and write-off of the other countries will bankrupt Europe. With option 2, Greece does an "Iceland" and after more pain, begins recovering, though from a lower base, resulting in evidence that there is successful and meaningful life after the Euro. There is no 3rd option, the "do nothing" option, because "do nothing" resulting in the actualisation of option 2. It is important to remember that the decisions that are being made by all sides are NOT about saving Greece or the Euro, or France, Spain, or any of the rest. It is all very personal. It is about saving the stashes of dosh that these people have made, saving their status, and saving their jobs. And this goes for everyone involved in this. Tsipras is doing what he's doing because this is the only way that he saves Syriza from political oblivion. The other Greek parties are supporting him because (unsubstantiated, but my own guess) they know that if they do not, there are "perp walks" in their futures. If there wasn't the implied threat from the Greek Parliamentary Committee on the debt, then they would each be doing everything they can to undermine Tsipras and Syriza. Beyond the threat of the Parliamentary Committee findings, there is the "Lost List" (the ""Legarde List") of individuals with significant bank account at the Geneva branch of HSBC in Switzerland, a list of 1991 names that then Finance Minister Giorgos Papaconstantinou, um, lost. There is a much longer list of 80,000 names that Syriza is looking at. There will be plenty of politicians and various ministry officials on that list. So the deal is pretty simple, support Syriza in getting Greece out of the Euro and implementing a recovery programme, or go to jail. I think we have the basis for a Greek Government of National Unity, headed by Syriza and Mr Tsipras. We might even see the return of "V for Varoufakis". The Loan Shark enforcers are in a difficult position and must decide which will be worse, general rebellion across the Zone from a "saved" Greece option, or a punished Greece facing more pain as a warning to France, Spain and the rest. It must be difficult to know that whichever choice you make, in order to save your own stash of dosh gained through screwing Greece in the first place (the lenders AND the Greeks who did the deals), more suicides, closed businesses, lost futures, are on your head. But hey, you were (and are) just "doing God's work". So there is no way out for any of them. Save Greece, lose the Eurozone. Kill Greece, save your stash and kick the dead-Eurozone can into the next guy's term in office. Then, like the Dark Lord Cheney, you can blame your unmitigated disaster on the next poor schmuck.